INSTANCES OF SUSPECTED cheating by students sitting the Leaving Certificate have increased by 11% this year. This follows the State Examinations Commission (SEC) confirming that a total of 43 Leaving Certificate results have been permanently withheld from students amid suspicions of cheating. Such rulings are open to appeal and the spokeswoman said that in addition the SEC has provisionally withheld 37 other Leaving Cert results, on a without prejudice basis, pending further communication with the schools and candidates concerned. The combined 80 total for the 2018 Leaving Cert compares to the combined 72 total last year – an increase of 11% on 2017. The 2017 total was made up of 38 permanently withheld results and an initial 34 results provisionally held back. After issues over the 34 provisionally held back results were addressed last year, the SEC spokeswoman said that the final ‘with-held result’ figure for 2017 was 57. This compared to 100 for 2016 and 101 in 2015. Those suspected of cheating in the Leaving Cert this year represent a tiny proportion of the some 57,000 students to sit the exam this year. Figures previously released by the SEC show that teenage boys were twice as likely to cheat in the 2017 Leaving Cert as teenage girls. 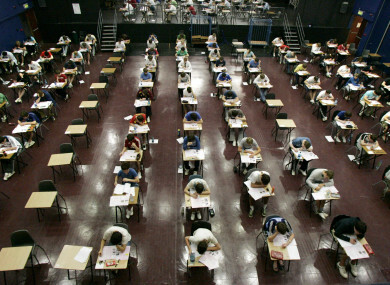 At each exam centre for the Leaving Cert across the country, notices are placed in prominent locations warning students of the penalties for cheating. Students are warned that they are liable to have their whole examination cancelled if they bring in the likes of iPods, MP3/4 Players or mobile phones into the exam hall. Students are also warned that they risk having their exam cancelled if they aid or attempt to aid another candidate or obtain or attempt to obtain aid from another candidate. Candidates also face having their exam cancelled if they attempt to communicate with other students in the exam centre during the exam or by electronic means with people outside the centre. She said: “This is essential in order to uphold the integrity of the Irish State examinations system and to underpin equity and fairness within the system in order to enable all candidates to display their achievements on an equal footing. The most common penalty applied is the withholding of the result in the subject in question. Where a more serious breach of the regulations occurs such as copying in more than one subject, withholding of all results and/or debarring from repeating the examination may be applied. According to the SEC, cases of suspected cheating can come to light in a number of ways including: an examiner may detect similar work from more than one candidate when correcting work from the same centre or an examiner may discover memorandum, notes or paper brought in by a candidate in an attempt to gain an advantage in the examination. Cheating can also be detected when an examination superintendent sees a candidate using prohibited items such as books, mobile phones or attempting to contact another candidate in the centre. Email “80 Leaving Cert results being withheld due to suspicions of cheating ”. Feedback on “80 Leaving Cert results being withheld due to suspicions of cheating ”.